Volunteerism is an integral part of Big Brothers Big Sisters of the Triangle’s commitment to the communities where we live and serve. Throughout the year, your employees can build relationships and hone their leadership skills by volunteering with us in their local communities. 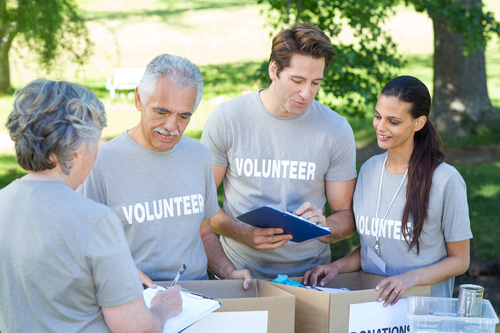 Here are some of the ways your employees make a difference through our Philanthropy in Action program. These projects provide employees the opportunity to participate in large-scale volunteer projects organized by BBBST. Sample projects are listed below, but if you have another idea in mind we would love to hear about it! Our children are often in need of supplies so gathering your team together to create “kits” that we can provide is a great way to help. Birthday Party Kits – a little goes a long way in helping parents provide a fun and decorative birthday celebration for their kids. balloons, plates, utensils, decorations, party favors, etc. School Supplies – not just a need at the beginning of the year, school supply needs are a year round challenge. INCLUDES: pencils, paper, crayons, erasers, scissors, glue, notebooks, calculators, etc. Summer Survival Kits – during the summer many kids don’t have access to nutritious food or outdoor activities. INCLUDES: non-perishable snacks, footballs, soccer balls, basketballs, jump ropes, etc. Ready to get your company involved? Send us a message today!